Experts will all agree that potty training boys can tend to be a lot more difficult than potty training girls. First of all, it may be difficult for them to be able to learn how to aim. This is sometimes why parents get the little potty chairs that they sit on to pee. The good news is that there are some great training urinals that can help your child learn to pee standing up, making it easier to train them. A training urinal can be a good way to train boys for using public toilets (schools, restaurants, shopping malls, etc). There are some many training urinals out there on the market. One of our favorites is the Cuddle Baby Generation II Boy Urinal Potty Training Game. This urinal actually turns potty training into a game for your child, making it fun for them to use the potty as they should. Let’s check out this urinal and other great options as well. Our top pick is the Cuddle Baby Generation II Boy Urinal. It is available in several different designs and colors, and really has a lot of great features that you will want to know about. One of the best features is that it turns toilet training into a game! It can be mounted just about anywhere, at any height, making it fully adjustable to fit boys of any height. The game is actually a story that your child can learn about while they learn to toilet train. They even get stickers for doing a job well done! The bowl is large, making it easy for them to actually make it into the bowl instead of making a mess on your bathroom floor. When aiming at the spinner, sometimes the urine can splash back towards them if the stream is too forceful. Some consumers have reported that it does not stay mounted as well as they would have hoped. Next up is the ShakeLady Boys Potty Training Penguin urinal. It also has a target that is designed to help your child learn to aim. It has a really cute design, which really attracts children to it. It is suitable for boys up to six years old. It is also available in multiple colors. It is really easy to mount with a suction cup, or it can be stood on the floor for younger children. It is made up of safe, non-toxic materials that are easy to clean. You don’t have to worry about germs and bacteria building up. It stays securely mounted, without falling down. Unsecured urinals can really lead to quite a mess, so this is definitely a plus! The bowl is not very large, which may make it harder for beginners to aim into it. Can lead to some mess if they are not careful. The spinner has a tendency to splash back at times, depending on the flow. Thankfully this isn’t noted to happen very often. We also really liked this urinal design by GrowRight. 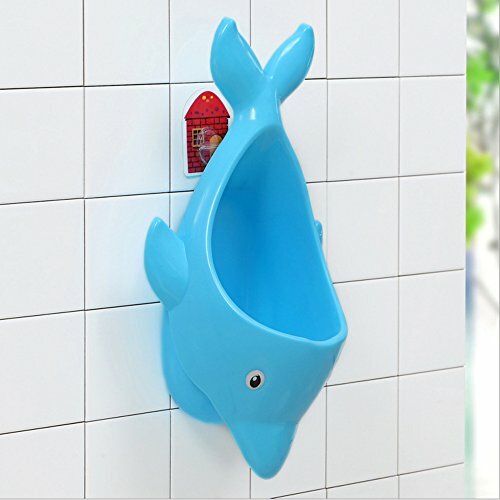 It’s a very unique looking dolphin shaped urinal. It has an eco-friendly design and is made up of a non-toxic material that is safe for your child. It also has some other great features that you should know about. It has a removable mounting plate that makes it easy to mount this urinal on the wall in your bathroom and take it down when you need to as well. It comes in two cute designs – a dolphin and a frog. Both styles are sure to be eye-catching for your child and fun for them to use. The bowl is really deep, and it makes it easy to prevent any sort of splash back mess. It is a little bit smaller than it seems it would be, and this has been a disappointing feature for some consumers. It does not have any sort of target to aim at. It just has a really large bowl, but for kids that love targets, this one may not be the one. Potty training doesn’t have to be a tedious task – you can make it fun! 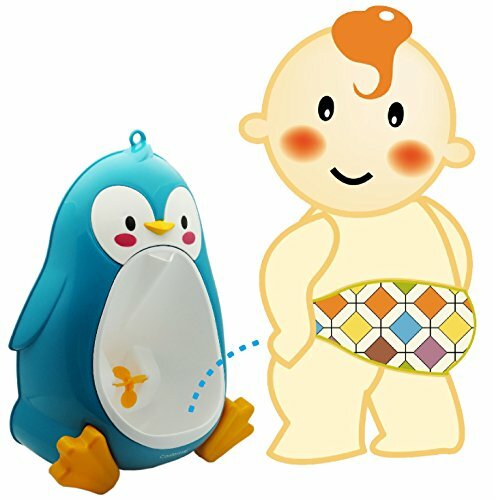 Try this Penguin training urinal that’s designed to motivate and encourage your baby boy to go pee by himself. 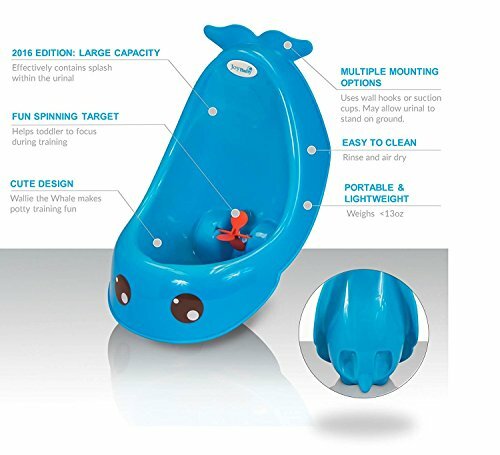 It has an innovative water wheel that rotates so that your little man is focused on it while trying to go. It teaches him to balance, self-reliance, and independence. In time, your little boy can pee on his own. This training urinal for boys is portable, removable, easy to clean, and lightweight. It comes with suction cups so you can adjust it to the height of your toddler. Simply attach it to the surface of the bathroom. There’s also the option of setting the urinal on a flat surface if that makes it more comfortable for your tot. The Penguin training urinal is made of high-quality PVC and PP material, meaning it’s safe for the environment, odorless, and nontoxic. Here’s another fun way to train your baby boy to go on his own. This is one of the parts of parenthood that can be exciting and daunting at the same time. Children go through a series of changes in their early years and being a new parent, you must make sure to give your kids time so they can learn from you and you from them. When it comes to using the bathroom, the regular urinal will be too high up for your little man and you don’t want your bathroom to be all messy, not to mention stinky. 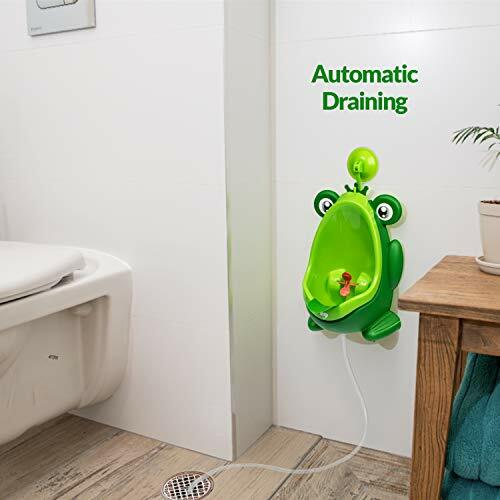 This cure and fun Frog Potty Training Urinal is a great solution. It essentially teaches your kid not to be anxious about peeing on his own. This playful urinal training teaches independence and teaches little boys to develop good habits. This urinal is adjustable and comes with rubber suctions and adhesive hooks, so you secure it depending on your preference. At the back of the urinal are suction cups so it will remain secured to any surface, be it wood, wall, or tile. The Frog Urinal is fitted with a urine guard to ensure that your hands are always clean and prevent urine from spilling. When you buy this, you get a detachable waste bucket too. This product is made with eco—friendly PP material is basically safe, odorless, and nontoxic. This colorful and attractive boys’ urinal can be mounted on the wall or in an upright position on the floor. It easily attracts the attention of your little man and teaches him to pee on his own. The bowl insert is removable, making it easy to clean. Installing and removing this Froggy training urinal is easy and quick. You can either mount it on the wall using its two suction cups or leave it be and let it stand upright. Place it in the bathroom or in a room where your boy feels convenient. This urinal looks like a toy, which means you won’t have a hard time convincing your tot to try and use it. This is one of the best ways to get rid of diaper usage and teach your boy independence. It will also help him improve his balance and aim at the urinal. 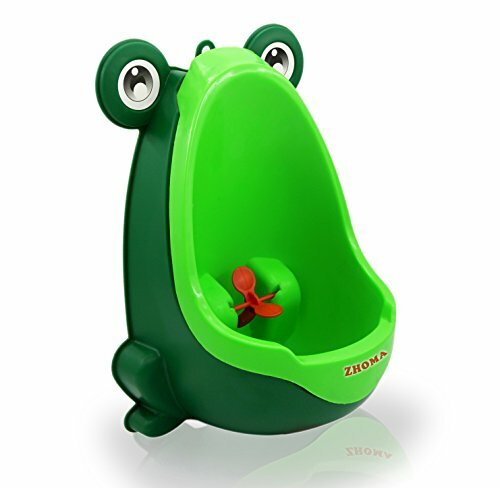 Here is another Froggy training urinal for little boys. 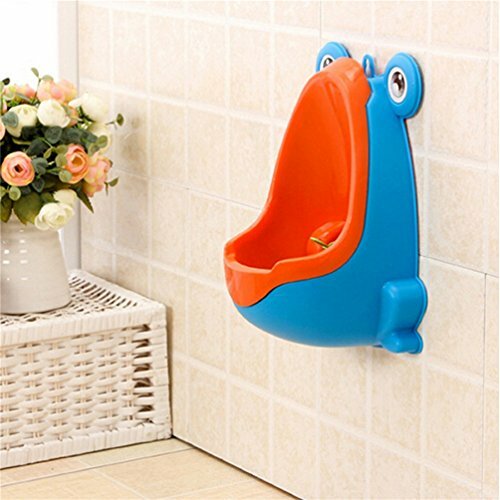 The Zhoma baby urinal is another fantastic solution for your little man who wants to be a grown up! This urinal is made of high-quality PVC and PP material and is odorless, non-toxic, and eco-friendly. It has the capacity of 1000ml, but the insert is removable for ease of cleaning. This urinal comes with a water wheel that entertains your kid while he’s giving it a go, and allows him to focus on his task. It comes with suction cups so you can attach it to your bathroom wall at the right height. The whole urinal has a motivating look – perfect for little boys who are anxious to pee without a diaper. This is ideal for baby boys ages two to six. When your kid finally knows how to pee, this urinal can still be used until he gets used to a regular toilet bowl. The removable bowl reduces splashes so cleaning should be easy. Simply remove it if you need to clean it, empty it, and make sure it’s sanitized and ready to be used by your toddler again. When shopping for a training urinal for your child, there are a few things that you may want to take into consideration. First, you will want to find a urinal that is easy to keep clean. Boys tend to make a big mess when they are potty training, and these messes are not much fun to clean up. Because of this many parents opt for a potty training chair designed for boys, the main difference being that it has a pee splash guard, something usually not found a potty training chair for girls. See our complete guide to buying potty seats and chairs here. The only problem with relying fully on potty chair for a boy or even a simple potty seat ring that sits on top of the toilet seat is that boys won’t learn the most important skill- aim! Because of a urinal can be a great potty training tool to get them used to pee the way they usually will as an adult man standing up. Another great feature to look for in a training urinal is a target. Targets help to keep your child on track with learning where to pee. It also helps to make it something fun for them and may make them want to use it more often. This can make training them easier on you, and we all like easier. You should also pay attention to the size of the bowl. A smaller bowl is going to lead to splashes and messes, while a larger bowl may help to prevent some of this. Be sure to keep this in mind when you are shopping around. Finally, make sure that you consider how the urinal is to be mounted and where you will be mounting it. Some urinals will come with adequate mounting hardware, making it easy for you to mount it on your bathroom wall. Others may not have the best mount-ability options. The good news is that there are some great training urinals out there for boys. Our top pick is the Cuddle Baby Generation II Potty Training Game. Most kids really love the game aspect of this urinal, but on top of that, it is really easy to mount and easy to keep clean. It also has a fun design. Try this one out, or consider one of the others that we have reviewed. Let us know which one you like best! These urinals can be a good combo with a good potty training seat with a built-in ladder so boys learn to do #1 in the urinal and #2 on the adult potty with the help of a kids toilet seat and a ladder to help them up. The two will help your boy become independent and learn to do both by themselves and prepare them to use public restrooms as well as go on their own once they get to school.